Detecting some activity in a nearby building, I sneak inside, hoping to find someone who can tell me when I am; but I inadvertently crash some sort of royal gala, drawing the ire of one individual and the admiration of another. 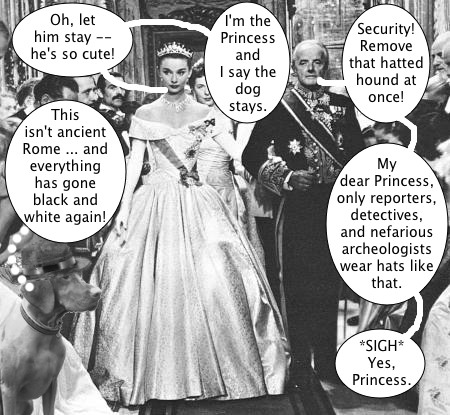 Later, the Princess invites me to tea, where I innocently suggest we go for walkies, not realizing that the Princess has never been out on her own before. In the plaza, we meet a friendly gentleman who buys the Princess her first ice cream cone. Sadly, I do not get any. 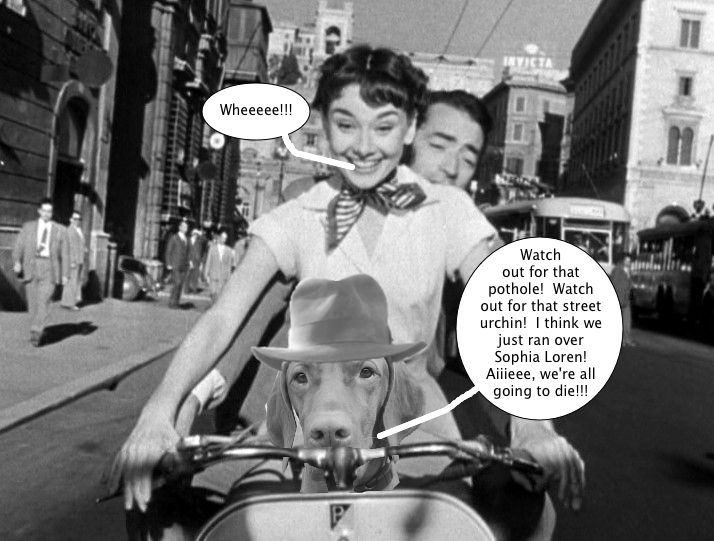 Afterwards, the gentleman suggests we go scooting. I never knew that humans engaged in this behavior — this will make a fascinating addition to the anthropology course I teach at the university! Unfortunately I soon realize that i misinterpreted the type of scooting that was intended, once again illustrating the difficulties inherent in trying to understand an alien culture. This is a completely different activity from what I expected, less fun and, once the Princess takes the handlebars, much more dangerous. We soon arrive at a local attraction, a large wall engraving that is evidently worshiped by the locals as some sort of greedy and vengeful god. Unfortunately, like Cassandra, my predictions go unheeded. After dropping our friend off at the local emergency room, the Princess and I return to the piazza for more ice cream, where we say our goodbyes. Then, suddenly, from out of nowhere, a bizarre visitor appears! Who is this strange character? How does he know my name? And where did he find a DeLorean? I will find the answer to these questions — because I am Dennis the Vizsla, and I never give up. That pwincess was vewy nice eve though you had to be in black and white..I hope she shawed that final ice cweam wif you. 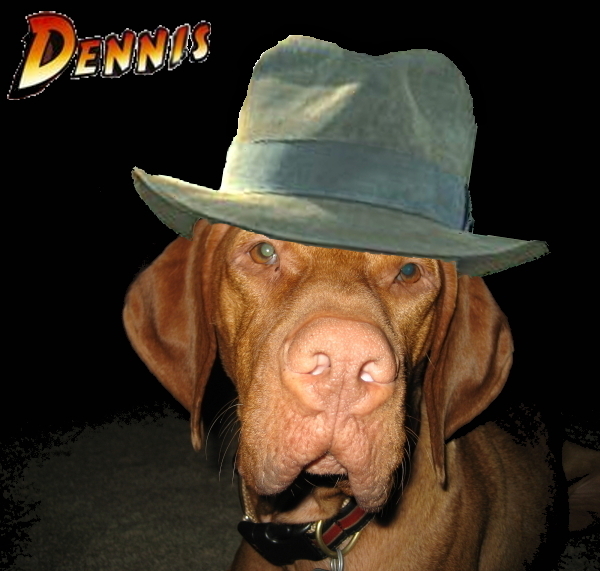 I get so wowwied when you have these adventoowes ,but I have total faith in you..you awe aftew all DENNIS THE VIZSLA! Wooos Dennis! One of Mom’s favorites, and now it is one of mine! he, he he……..I hope woo got some of that ice cream, but beware of scooters, Mom gets mad if we do that!. DON’T. GET. IN. THE. DELOREAN. Promise, Dennis? Get in. It’s probably time for Dennis to go back to the future to fix things. Oh Oh. I hope Michael J Fox still has his license. He is a bit ill these days Dennis, maybe you should take the wheel. I know you… you will not give up! Whoops! We loved it when that dumb guys hand got bit off. 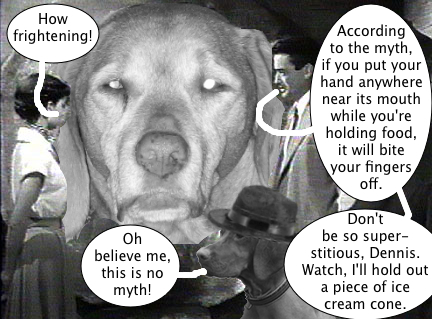 Why won’t anybody listen to the dog? This was one of your most best adventures ever! 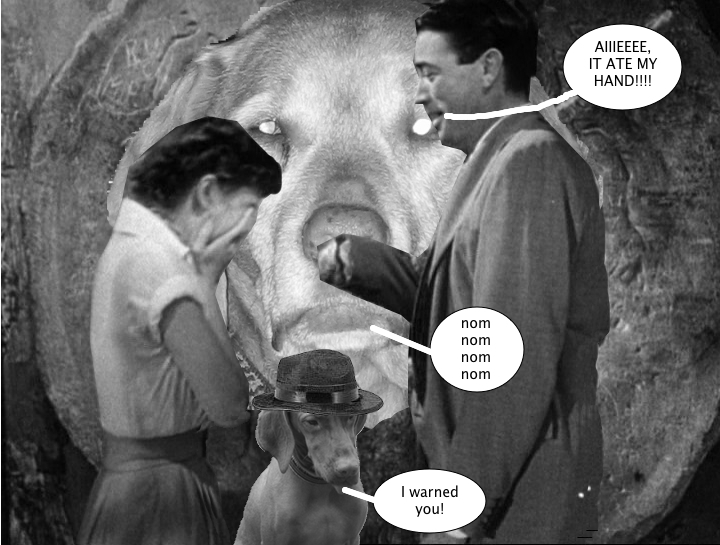 Oh come on, give Gregory Peck a hand. We have no doubt,Dennis – you WILL get to the bottom of this. I think the air in the mountains of western North Kharolina is a bit thin! i’m sure glad you know how to show a princess a good time. Damn, all that weight on her head must be giving her a headache! she looks pissed off… then throw away the crown and its happy Dennis time! 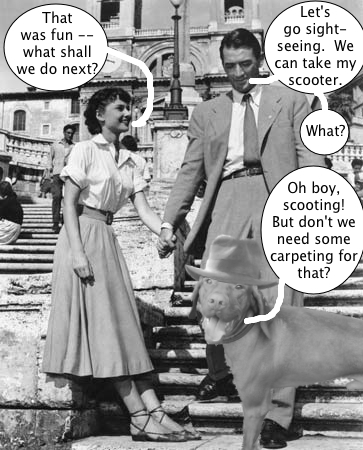 You’re right.. scootin’ requires carpet not wheels. This was a lovely adventure. 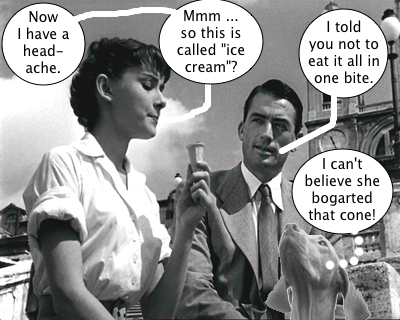 I am quite fond of ice cream myself. 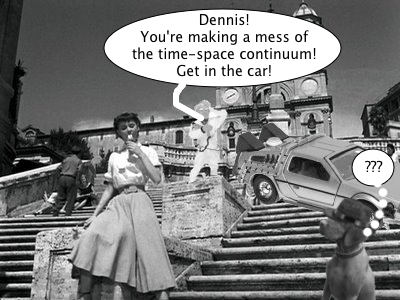 Dennis, whatever you do – don’t get in the car! Go to the palace with the pretty princess and get some ice cream. mmmm ice cream. you are teaching valuable lessons across space and time. 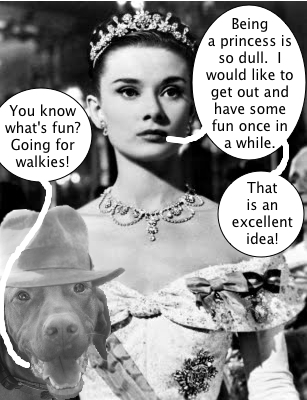 Dennis, you did the pwincess a favor by showing her how FUN walkies and ice cream can be! And you are SO wise… I can’t wait for the next part! 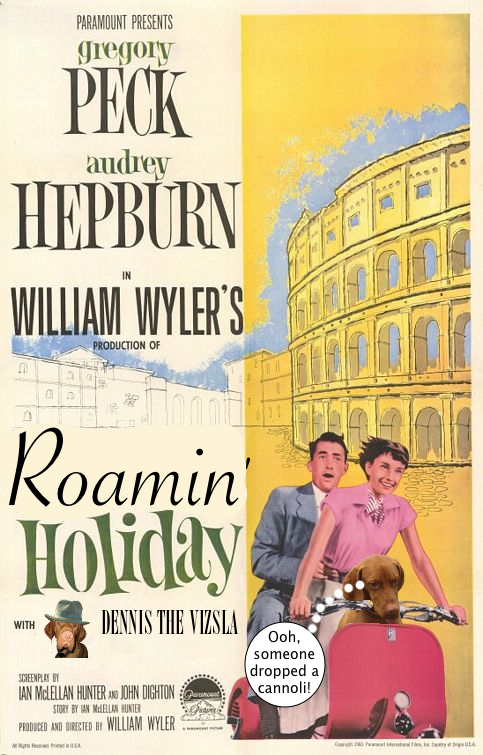 Sweet adventure Dennis! Glad you survived the Princess driving the scooter. It did look a bit hair raising. Can’t wait to hear about your next adventure! WOWOWOWOW!! A princess, walkies AND ice cream!!! What a fun adventure! “someone dropped a cannoli” that’s damn funny! !